Florida Bee Removal specializes in live removal and relocation of bees in St Petersburg. In addition to bee removal (including Africanized bees) we remove wasps, hornets, yellow jackets as well as bee hive and honey removal. We are licensed and insured and perform bee removal service not only in St Petersburg, but the entire state of Florida. Call Florida Bee Removal whether you need bee removal services, or perhaps you have a bee swarm or yellow jacket nest on your property and would just like additional information. We have been in the bee removal business over 50 years and enjoy every bee removal adventure. You are never a bother to us, we love the phone to buzz for bees! If you are located in Florida, you come into contact with bees. It’s just a fact of life. Sadly, you don’t know if you’re dealing with aggressive bees or non-aggressive bees until it’s too late. At Florida Bee Removal, our experts are highly qualified and properly trained in safe, effective bee removal techniques. We offer same-day service at a fair price. When we can safely and effectively perform it, Florida Bee Removal prefers to practice live bee removal of the bee hive if at all possible. When we have safely removed the live bees from your property in St Petersburg, we turn them over to a local beekeeper so they may be safely managed. Our goal is not to exterminate bees, rather remove the danger of the bees from your property and keep them in their natural habitat so they can continue benefit our evironment. Other stinging and aggressive insects such as wasps and yellow jackets must be exterminated and removed from the site. HOW MUCH DO YOU REALLY KNOW ABOUT THE BIRDS AND THE BEES? WELL, IN SOME CASES, BEES MISTAKE AVIARIES FOR APIARIES. WHEN BEE SWARMS TAKE A LIKING TO BIRD HOUSES, THE BIRDS, DUCKS, OWLS, AND OTHER AVIANS, MUST DEPART. A BEE SWARM CAN CONSIST OF UPWARDS TO 15,000 INDIVIDUALS, EACH WORKER BEE POSSESING A VENOMOUS STINGING DEVICE. THEIR VENOM TRUMPS CLAWS AND BEAKS. 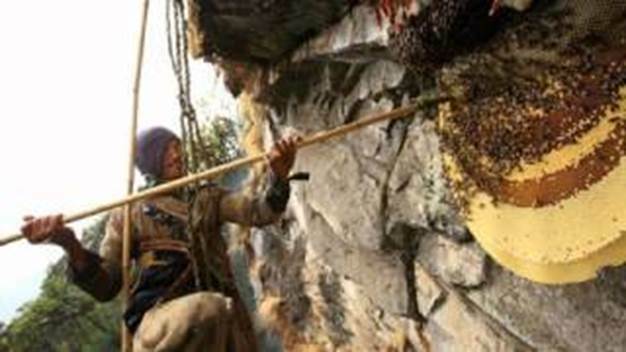 12,000 years ago, high in a Himalayan Village, bee hunters prepare to harvest honey from the lofty hives of Apis laboriosa , the world’s largest honey bee. While hanging from a ladder, overlooking spectacular views of swift flowing rivers and late spring flora, a seasoned honey hunter dislodges a huge honey comb into a wooden basket . Below the cliff, a fire smolders and spreads a cloud of smoke onto the bee hives above. The bee colonies sense an impending fire and remove themselves off the combs, as they gorge themselves with a survival meal of their hard earned honey. In the village, a sense of intense jubilation takes place when the bee hunters return with their sweet harvests. The bee hunter tradition continues to be passed down through the ages. Some have fallen to their deaths in this adventurous pursuit. Most, however, experienced a satisfying sense of accomplishment in the face of extreme peril. When honeybees are found flying around light fixtures, it could be due to several situations: 1- A bee colony may have entered the void behind the light; 2- food seeking bee scouts may perceive the light as time to hunt for food; 3- “ Zombie “ bees , infected with parasites, may be attracted to the light source . This may include sick or dying bees. The facets, in honey bee eyes, recognize UV light better than humans. Before sunrise, bee colonies will have already taken preparations to begin daily food excursions. The “grocery bees” will have already eaten their breakfast of honey. UV receptors will have alerted them that dawn is near. Usually, only a dozen or so bees will be noticed by a light fixture. There is no useful purpose for an entire bee colony to leave the hive at once. In most cases, bees flying around night lights, indicate that a bee colony resides in the near vicinity and should be investigated. Check out our web pag for our bee removal customers in St Petersburg.